Relax in idyllic surroundings at the Conrad Koh Samui luxury resort. Stay in a luxury villa with a private balcony that overlooks the pristine white beach. Swim in your private 10m pool. This luxury property contains four amazing restaurants, a private cellar containing more than 3,000 vintages, and a fully equipped gymnasium. Indulge in a personalized holistic treatment at the resort’s two-storey luxury spa. Each spa treatment room has its own private deck with a beautiful view of the sea. Enjoy the peaceful sea view from the private manicure and pedicure salon. Dine at Jahn, one of the resort’s four exquisite restaurants. Expert chefs combine the finest imported ingredients and traditional Thai cooking techniques to create memorable pan-Asian signature dishes. Exercise on the outdoor wooden yoga deck, or sunbathe on the 180m floating pier. The elegant, airy meeting room is an ideal venue for conferences and social events. Easily accessible from Bangkok Suvanarbuhmi Airport, Koh Samui is an idyllic tropical island, with soft white beaches, lush jungles, and miles of beautiful azure sea. Explore the nearby Fisherman’s Village in Bophut to get a sense of the island’s cultural heritage. Savor the flavors of Bophut’s many specialty restaurants or browse the elegant Chinese boutiques. Stay in a luxurious west-facing villa with a private pool at the Conrad Koh Samui. This tropical resort is equipped with four fantastic restaurants, a gym, and a truly indulgent Spa. 65sqm Contemporary Thai-inspired villa, private plunge pool, Gulf of Thailand views, WiFi. Complete with a 10-meter infinity-edge pool, this elegant villa offers spectacular views of the Gulf of Thailand and the majestic sunsets over the fabled “Five Islands” of Koh Samui. The suite is complemented by quality furnishings and designer interiors, and is connected with in-room technology including next generation Apple TV based computer systems IPTV, iPod docking stations, and complimentary WiFi. Relax and refresh in the stylish bathroom featuring a rain shower, oversized soaking tub and spa-quality amenity collection. 96sqm Freestanding villa with private pool and terrace, ocean views, soak tub, complimentary WiFi. Complete with a 10-meter infinity-edge pool, this luxurious freestanding villa is set close to the calming waters and romantic sounds of the Gulf of Thailand. Offering majestic sunset views over the fabled “Five Islands” of Koh Samui, this elegant villa features quality furnishings, designer interiors, and in-room technology including next generation Apple TV based computer systems IPTV, iPod docking stations, and complimentary WiFi access. A sumptuous marble bathroom offers spa-quality amenities including an oversized soak tub, glass-walled rain shower and twin vanity sets. 96sqm Freestanding villa with private pool, ocean views, soak tub, Apple TV, complimentary WiFi. Complete with a 10-meter infinity-edge pool, this luxurious freestanding villa offers commanding views of the Gulf of Thailand coupled with complete privacy. Enjoy the state-of-the-art technology including iPad, Bose Stereo surround sound systems, Apple TV based computer systems IPTV, iPod docking stations, and complimentary WiFi access. A large walk-in closet equipped with board games, a fully stocked mini-bar and an espresso machine provide the finishing touches to the villa. The sumptuous marble bathroom is fitted with premium, spa-quality amenities including an oversized soaking tub, glass-walled rain shower, separate water closet and twin vanity sets for the ultimate indulgent experience. 225sqm Private location, 22.5 meter infinity pool, circular bed, expansive living & dining space. 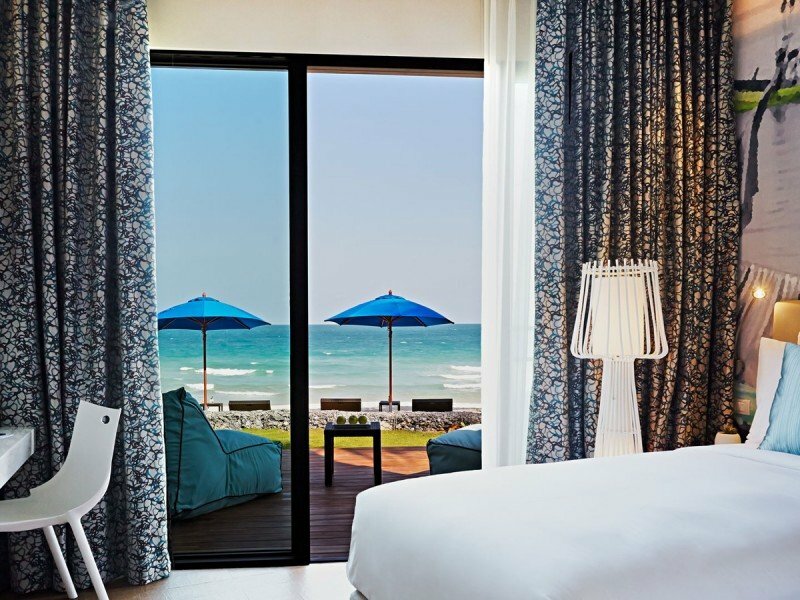 Experience the best of tropical resort living in this premium suite at Conrad Koh Samui. Arguably one of the finest luxury villas on the island, the Conrad Royal Villa is discreetly situated at the edge of the resort, offering absolute privacy and the most incredible views of the Gulf of Thailand. A private stone pathway winds up through landscaped gardens towards this two-storey, Thai style villa. Opening onto a stylish foyer, the villa features a manicured viewing lawn and 22.5 meter infinity-edge pool, which stretches the length of the villa and seemingly into the azure sea and beyond. The expansive living space is complete with designer furniture, including an oversized circular bed facing the spectacular vista of the sea. Soak in the oversized tub or refresh under the soothing rain-drop shower. Enjoy an unforgettable meal with friends at the sunken dinner table.